Guaranteed to work for years! These thermal fuses have never failed! Power light is not coming on. The installation instructions provide detailed procedure and pictures on how to safely install the blown thermal fuses. They also include what to watch out for and ways to verify proper installation. Improper installation of these thermal fuses can be hazardous and possibly cause a fire. That is why this kit was created. The thermal fuses are crimped into place to insure a safe installation the same way Bunn manufactured this product. Each harness has been tested, inspected and verified to provide optimal performance in your Bunn Coffee Maker. Quadrapoint has researched and found the best thermal fuses that will provide a lifetime of protection. Quadrapoint uses the highest quality crimp standard in the industry. Since we have been in the business of making quality products for decades, you can buy with confidence. This is not manufactured by Bunn-O-Matic. numbers are being used without permission. No endorsement, affiliation or recommendation is implied. They are included for reference purposes only. 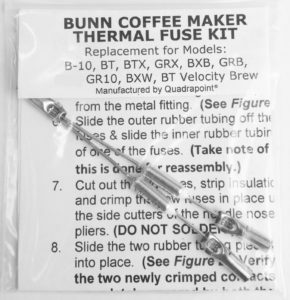 NOTE: Quadrapoint can not guarantee that this is what is wrong with your Bunn Coffee Maker, but if your power light is not coming on and the water is not heating there is a very good chance that this simple repair procedure will fix your coffee maker for years to come. Please look at feedback to see the many satisfied customers.